Koike Yoshiro has lent his name to generally identify this type of Heianjo Zogan Mon Sukashi Tsuba. The Tsuba were bought in this fashion and the Sukashi, sometimes all and sometimes three, for instance, were then fitted with the buyer's personal family crest (Mon). 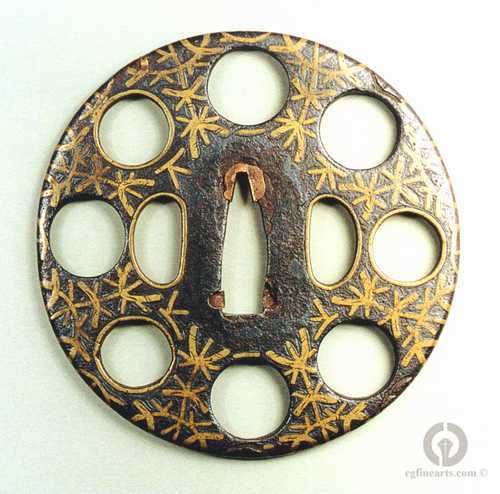 Virtually all the inlay remains in this Tsuba, just a few small pieces near the edge are missing. We can arrange for this to be restored and for Mon to be fitted for an extra charge.